PrivaZer is cleaning tool that scans and cleans your computers and storage devices. It safeguards your privacy by removing unwanted traces of internet activities, software use, USB history, registry and files in your computer and storage devices securely. In addition, it optimizes storage space and improves system performance and speed. PrivaZer can scan and remove residual traces in MFT, free space and USN journal, internet activities, registry, USB history and software use in your computer hard drives. The scan and clean results are displayed in their respective viewers. Download and launch privazer_free.exe. Select "Run PrivaZer without installation" and follow the next steps. You'll have to repeat the process everytime you want to use the program. lautrepay wrote: Download and launch privazer_free.exe. Select "Run PrivaZer without installation" and follow the next steps. Not. You could copy privazer.exe, sqlite3.dll, and tld.txt to another folder. I tested PrivaZer before. It calls home (no option to disable this behaviour) and it writes choice.default, data.ini, new_version.txt, and data_patch.tmp.doc.zip to AppData\Local\privazer folder. I also found hello_world_result file in AppData\Local\Temp folder. If you copy privazer.exe, sqlite3.dll and tld.txt to another folder and run the executable it will leave behind the files you mentioned and it will call home. If you run privazer_free.exe as I described, it's stealth. It leaves behind the hello_world_result file, but in C:\Windows\Temp, not in ApppData\Local\Temp. And it won't call home. Thanks for posting. 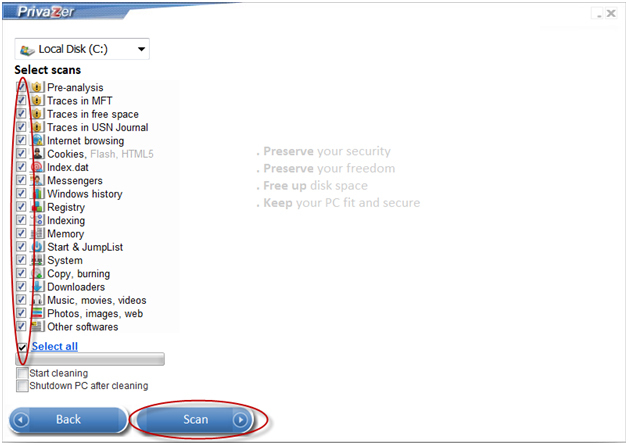 Been looking for a sort of all-in-one cleaner program that will also handle USB-related registry entries. Will it take ou the same stuff that USB Oblivion gets? Yes, my mistake. But, I am not sure about calling home though. Everytime I try to launch a network sniffer tool, PrivaZer crashes. Can anyone test this? webfork wrote: Thanks for posting. Been looking for a sort of all-in-one cleaner program that will also handle USB-related registry entries. Will it take ou the same stuff that USB Oblivion gets? No. AFAIK, only USB Oblivion can properly take care of those kind of registry entries. Then move the executable placed on the desktop to a folder of your choice and launch it. Settings can be saved to the application folder. I've tested v1.2.15 (currently it's at v1.2.21) and found it portable and stealth, and I couldn't detect attempts to call home. If someone is interested, further tests are welcome. 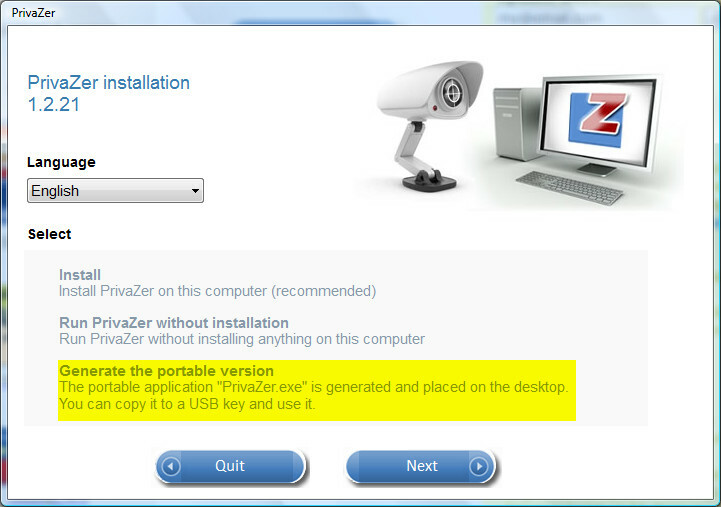 Note: the option, mentioned above, to run PrivaZer without installation is still available. For the time being, I would ask the mods to move this thread to the Submission board. Thanks in advance. PrivaZer refuses to launch if the Language is set to Chinese PRC. This occurs with the installer and the (built elsewhere) portable build. Instead of launching the software a message is given that PrivaZer will be available in your language soon and a webpage is launched. The portable doesn't seem to respect the language selected on creation. Any way to change that? Added to the database. If it's useful for you, vote @ http://www.portablefreeware.com/index.php?id=2350. Hum.... be careful. Very destructive tool ! I have lost several function in my Windows Seven. Don't speak me anymore of that software ! !